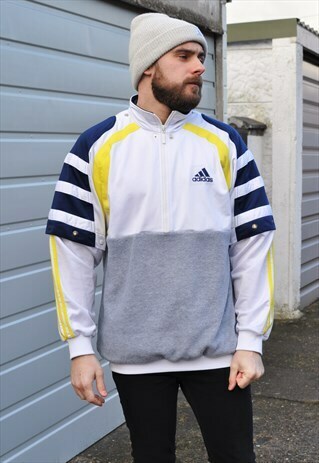 We've got an amazing one off item, a classic sporty 90's track jacket with a twist. Sports jackets are everywhere at the moment but we have one to make you stand out from the rest. We've re-worked this jacket by taking a vintage 90's adidas jacket body with popper sleeves and adding a grey fleece sweatshirt bottom. It's got great details, like blue and yellow stripes and airtex panels under the arms. As this is made from vintage garments there may be signs of age, wear and tear, overall the jacket is in good condition. Any flaws are reflected in the price. It's labelled as a UK size 38/40 and it measures and fits like a large on our model who is a medium build and 5ft 9. For exact measurements please check the sizing details. Measurements in inches laid flat - Chest - 23.5" Length (shoulder to hem) - 29" Sleeve length (armpit to cuff) - 23.5"